Australia is one of the world’s most exciting and promising photovoltaic markets, which was once again confirmed in the course of a number of conversations with customers during my visit last week. In all probability, after its record year in 2018, the Australian PV market will significantly grow again to 4.4 gigawatts this year. In addition to photovoltaics, storage systems are becoming ever more important, not only for independent electricity supplies for homes but also, in particular, for the power plant segment. 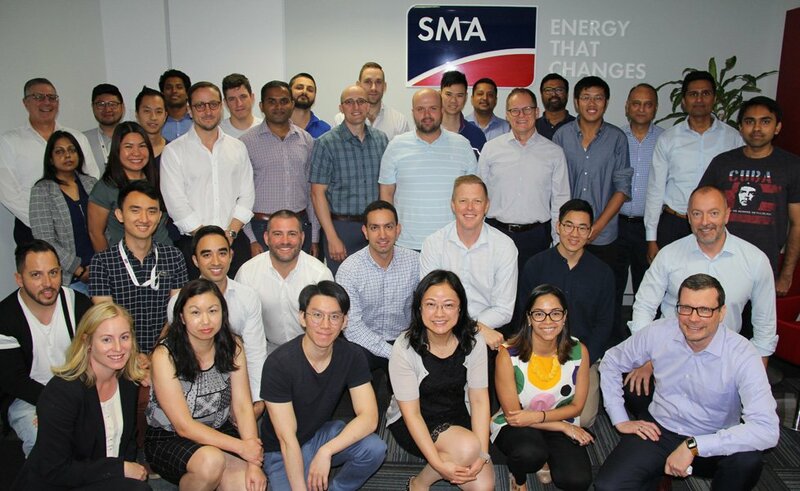 When SMA first set up its sales and service subsidiary in Australia in 2007, it dealt mostly with installing off-grid systems for supplying remote settlements in the Outback. A lot has happened since then. Australia now boasts more than 9 GW of photovoltaic power. Large PV power plants gain in importance. They ensure a reliable, sustainable and cost-effective supply of electricity for tens of thousands of homes and businesses all over Australia. Last year, SMA alone commissioned inverters with a total power of 1.8 GW at Australian PV power plants. I would call that a great milestone. It also demonstrates that in Australia, it’s not just about the price of an inverter—it’s also a matter of high quality and innovation. After all, the ambient conditions there present quite a challenge, with significant differences in temperature, high amounts of dust and some very isolated locations. The technology used thus needs to be particularly robust, reliable and easy to transport and install. As a result, almost all SMA projects in Australia use our Medium-Voltage Power Station. It combines one or two Sunny Central inverters with the appropriate medium-voltage technology as a turnkey solution in a container. The latest member of our Sunny Central family is also enjoying a warm reception on the Australian market. With the Sunny Central UP, we have boosted the power by another 50 percent to 4.6 megawatts. Furthermore, the standard version features a hardware and software configuration that integrates battery storage systems connected on both the AC and DC sides without any additional components. PV power plant operators can therefore prepare for forthcoming changes to the feed-in conditions by the Australian Energy Market Operator (AEMO) and also feed in electricity at higher prices in the evenings. It is no wonder that our Australian customers want to integrate battery storage systems into both new power plants and those already in place. To meet that demand, we will be fitting DC-side battery connectivity not only to the Sunny Central UP but also to all our Sunny Central inverters that we deliver to Australia this year, and, before the end of the year, we will be able to retrofit existing PV power plants with a battery system in the field. Developments on the Australian utility market are not the only cause for excitement. On my visit, I also spoke to installers and distributors. They see a lot of potential in Australian homes and businesses, more and more of which are expressing an interest in obtaining their own PV systems to supply them with clean energy. The ideal solutions for them are the new Sunny Boy and Sunny Tripower inverters, which we will be launching in Australia in the months ahead. However, the main topic of discussion in our conversations was the new SMA PowerUP partner program. Australia was the first market where we rolled out the program a few months ago. SMA gives participating installers and distributors special offers, training and marketing and sales support. Our customers have given this a warm welcome and are intensifying their collaboration with SMA. I was delighted by the overwhelmingly positive feedback. I am now eager to see how other markets will respond to the partner program over the course of the year. I am also looking forward to finding out what comes next for the Australian market. We are already tackling our next major project: SMA is delivering 57 Medium-Voltage Power Station 5500 to BELECTRIC for the Limondale Solar Farm in New South Wales. The 349-MW PV power plant is to become fully operational in 2020. I am confident that many more projects will follow in all market segments over the next few years and that we will be able to play a decisive role in making solar energy a cornerstone of the energy supply in Australia. Here SMA CEO Jürgen Reinert writes about topics that move him.